Yet these conditions only enflame the use of cars to avoid breathing the smog on crowded buses trapped in the same gridlock, according to a story by Louise Watt of the Associated Press on the ABCNews site. "To be honest, the more the air is polluted, the more I prefer to drive, as I don't like taking a crowded bus or walking outside in such bad air," subway train driver Gao Fei told Watt. Thirteen million cars were sold in China last year, a number that has been accelerating like an avalanche as job growth from manufacturing feeds a growing affluence in the Chinese populace – one that has found its first true status symbol in the automobile. Despite the widespread use of coal to generate electricity in the Asian nation, most of the dark cloud is a result of too many cars in the bigger cities – places where transport via bicycle was dominant a short 20 years ago. 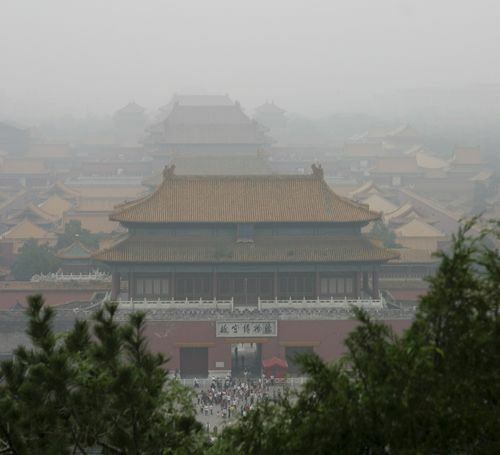 The capital city of Beijing has suffered really bad air over the past few days. China’s love of the automobile already poses a serious challenge to the government to cope with the toxic urban air pollution and its considerable impact on health, productivity and quality of life. In California's South Coast Air Quality Management district, where some of the worst air in the US can be found, they have studied the effects of ozone and particulates on human health for years. The immediate effects of breathing polluted air on a recurring basis are readily apparent: aching lungs, wheezing, coughing and headache. The effects are worse on those who already suffer from respiratory problems such as asthma, emphysema and chronic bronchitis. Smog is composed of ozone, which forms when nitrous oxides from combustion combine with volatile vapors from petroleum products in the warmth of the sun. Nitrogen oxides are produced by burning fossil fuels in motor vehicles, power plants, furnaces and turbines. Carbon monoxide is a by-product of combustion coming almost exclusively from motor vehicles. Very fine particulates, from smoke and diesel soot form in the air from nitrogen oxides and sulfur oxides, darken the air and can be inhaled and embedded deep in the lungs, leading to pulmonary fibrosis. Put them all together and you got an eye-watering, nose-offending, respiratory insult to the senses – unfriendly to humans and other living things. China’s having a big problem with a particulate designated PM2.5 — a recombinant air pollutant small enough to dig deeply into the lungs, a fact the AP accredits to the Beijing's former vice mayor, Hong Feng. According to Feng, 22 percent of PM2.5 in the city comes from cars; coal burning comes next at 17 percent and another 16 percent forms of construction site dust. One soldier remembers when the air wasn’t so hard to see through. "When I was young, our geography teacher taught us how to recognize the galaxy and I could find it at night, but I guess kids nowadays can't do that anymore," said Zhang Quan, 52. The massive market for cars in China has helped American automakers work their way of out of the economic recession, not to mention saving a few nameplates from disappearing entirely – except for poor Saab. China's citizens are pushing the government to more transparency where air quality is concerned even performing air quality tests themselves. The government now posts air quality updates on the hour online for over 70 cities, and two “Don’t Even Breathe Days” this month received ubiquitous coverage in the media. Despite official accusations of the sponsorship at the highest levels of Chinese authority, dastardly attempts to hack into the databases of The New York Times and The Wall Street Journal on the American national news tonight, we remain in favor of a higher standard of living for the people of China, and wouldn’t wish the lessons learned in California on anyone. If you didn't catch the news, the cyber attacks followed the periodicals publishing stories on the private fortunes amassed by the retiring ruling family. Could be true since they seem to be looking for the snitch that leaked the story. Getting back to air quality, Beijing has even tried a license plate lottery scheme to lessen the number of cars in the city, but as we already know, when you place an obstacle in front of a crowd, many of them will just find a way around it. It’s a funny thing about cities – public transit works best when the metropolis is built around the concept. When it’s an afterthought, there are always limitations on its effectiveness. Wang Hui, who lives in Beijing, bought a Toyota Camry last year, primarily for her husband’s enterprise in laboratory design. Now it’s so intrinsic to her life she can no longer imagine life without it. Nevertheless the growing smog problem is a serious concern for everyone. Remember Gao Fei, the subway driver we mentioned earlier? He sums it all up in a manner most of us can easily understand. "My dream is simple," Fei said. "To live in a warm apartment, drive a car I like and have a healthy child." Remarkably, when it comes right down to it, that’s really all a lot of Americans want as well. Image Source: Smog over Beijing's Forbidden City (2005) by Brian Jeffery Beggerly. Used under the Creative Commons Attribution 2.0 Generic license. Don, China's smog ends up here in the Northwest, as did Russia's wild fire smoke from last Summer. Here in Southern Oregon we are experiencing Winter fog because of particulates from China. This area used to have sunny Winters....no More. It's like the Chernobyl disaster when France said it had stopped in Belgium. Years later people were having their Thyroids removed. Seriously now. OTOH, China needs to do a bunch of things to get this situation under control. I've visited Beijing and Shanghai in 08 before and observed no hybrids on the road, at the time. Prius sales are almost 0 there. They need to adopt car emission standards similar to that of California and perhaps require that ALL new cars sold there adhere to CA's PZEV standards or better (like SULEV20). From the bad traffic I've seen, there's sure a lot of idling and stop and go. They should REQUIRE auto-start/stop systems on all new vehicles, at minimum. Mild hybrid or full-hybrid systems would be even better. They should encourage everyone to move towards that. China needs to further speed up their adoption of non-air polluting electricity generation (e.g. solar, wind, hydro) and adopt some grid storage technology. They need to also adopt very strict standards on their power plants. They also should shift from coal to less polluting sources (e.g. natural gas). They should also adopt strict building codes like California Title 24 standards to reduce energy consumption, to reduce the need to pollute. Perhaps they should also implement a congestion charge for non-EVs and non-PHEVs (similar to what I've heard in the UK). Obviously, they need to clamp down in pollution from factories as well. Hopefully the environmental officials over there can learn from California's model, can come up w/some very strict rules and has the power to enforce them. No argument with your China directed implementations, but they don't stand a snowballs chance in hell, as long as the rest of the world goes along with China's industrial pollution supporting cheap products. Countries need to apply an onerous import tax, based on pollution, targeted at products made in China and elsewhere, based on that products pollution index, too get China and others to implement change. In the mean time, the Northwest exports Train/shiploads of coal to China and we get it back in pollution. China is actually making some efforts to reduce pollution, and is positioned, industry wise, to do a lot more. Just needs more impetus. If you do a little research into origins of consumerism, you get an interesting, and particularly blindsighted individual: Thomas Malthus. The same idiot's rantings they design their one child policy after in China. Sad state of affairs that the chickens are coming home to roost. I hope they start reading Ludwig Von Mises for solutions! And maybe Murray Rothbard. Both wayyyy better economists than Thomas Malthus. Ron Paul alone is a far better economist than either the State of China or the State of USA. Allow business cycles to happen, and allow property owners [farmers] to enforce being smogged out of business in the courtroom, a lot will change. Hi Joe, spot on! I'd rather see myself as a citizen and not a numbered consumer. But! 'your responsibility as a 'citizen' in the Corporatocracy, is to consume or die, Nicolas. Careful where you tread in embracing Mises or Rothbard. LOL, this monkey is too old to dance. Citizen, I shall remain!